Kent-based Skelton Plant Hire has taken delivery of two new bespoke-built plant bodies from Andover Trailers, continuing a close working relationship between the two companies that began in 2004. The new bodies, mounted to 32-tonne 8×2 rear-steer DAF CF rigids, were bought as like-for-like replacements for two of the company’s existing vehicles, which also had Andover bodies. However, strong business demand means all four have been kept in operation – and they will work alongside the company’s original Andover body, which is mounted to an 18-year-old 24-tonne 6×2 DAF. The new custom-built bodies feature Andover’s trademark low-profile deck, which sees the cross members transect the body runners, instead of simply sitting on top. This low height, combined with the trucks’ rear steer capability, makes it possible to access both tight country lanes and tricky urban sites that would otherwise prove difficult with a 32-tonner. Also incorporated into the design is a double crank beavertail connected to a pair of 2.5m long hydraulic power toe ramps, alongside a 3.5-tonne hydraulic winch which aids loading and unloading. The eight pairs of lashing points on the deck offer maximum load security and flexibility, while Andover’s working at height system provides additional safety. “In a typical day, one of our drivers could be loading or unloading plant 10 to 15 times, so speed and ease of operation are vitally important to make the process as efficient as possible. Andover’s bodies and ramps are loved by our drivers because they make that part of the job so quick and easy,” adds Skelton. Skelton Plant Hire specified the bodywork with its own diesel tank for refuelling plant in situ – ranging from a small roller or telehandler, through to a 15-tonne excavator. The vehicles will predominantly be used to make deliveries throughout London and the south east, as well as handling selected work for established clients nationwide and in mainland Europe. The new trucks will be on the road six days a week, clocking up between 125,000km and 150,000km a year. 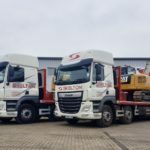 Skelton Plant Hire is looking to keep the vehicles in its fleet for at least 10 years, depending on future changes to legislation. A family-run business, Skelton Plant Hire was founded in 1988 with a single rental machine. Since then its fleet has grown to more than 850 pieces of plant and equipment available from its two depots in Kent.